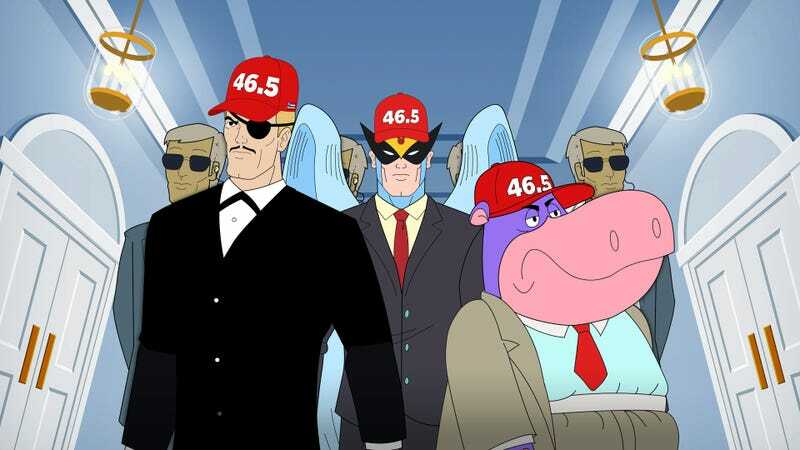 11 years after he last worked on a case, Harvey Birdman is returning to Adult Swim for Harvey Birdman, Attorney General, a new animated special in which the world’s greatest superhero/attorney must figure out how to remove a megalomaniac billionaire from the presidency. We’re obviously referring to Harvey’s former law firm boss Phil Ken Sebben, who has been elected president in this wacky cartoon universe, but there do seem to be some unsettling parallels between this and our horrible meat universe. The full cast of the original Harvey Birdman series—which ran from 2000-2007 on Adult Swim—is returning for the special, with Gary Cole playing Birdman, Stephen Colbert playing Sebben, John Michael Higgins taking minds as Mentok The Mindtaker, Paget Brewster hiding her secret identity as Birdgirl, Chris Edgerly getting that thing he sent you as Peter Potamus, Phil LaMarr getting in Black Vulcan’s pants, and—most importantly—Peter MacNicol getting another chance to steal the crrrrrest on Birdman’s helmet as X The Eliminator. A press release says the half-hour special will air in the fall. Also, now that this, FLCL, and Samurai Jack have all gotten revivals from Adult Swim, how much longer will we have to wait for more Venture Brothers? Two decades? Three? The RRRRRRRecommended Stories on Birdman's helmet!